MMOTOACTV 8GB is a fitness tracker and smart music player combined into a lightweight, wearable device. It's like having a personal trainer and a DJ joining you on your run or ride. It's the smart fusion of music and fitness that alters its workout performances with you, so you can focus on fitness, not playlists. Key Features of MOTOACTV include: Accusense Technology. 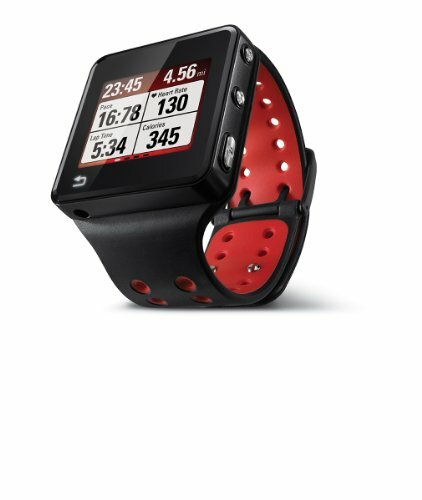 Track your running and biking performance outside and in the gym. Time, distance, speed, calories burned are all part of your workout.Smart music player (High-Performance Playlist). MOTOACTV's smart music player learns what songs motivate you by tracking your performance against your music. It determines which songs help you perform better (faster pace, more laps, calories burned, etc.) and then compiles them in a high-performance playlist. Now that's motivating.GPS. MOTOACTV tracks your outdoor training via GPS. Track yourself on the device on an uploaded map.Wireless connectivity to WiFi and smartphones. MOTOACTV gives you the option to stay connected to your smartphone, so you can get texts or calls (and rock out) via your stereo Bluetooth headphones (sold separately). Sync to your MOTOACTV.com account via your Android smartphone or WiFi to analyze your performance and set new goals.Goal Setting. Set goals and start training. Race against your previous workout or a challenge from a friend.Audio coach. MOTOACTV's audio coach keeps you moving with updates on your pace, split times and other performance motivators. Download customized training plans from MOTOACTV.com.Dual-mode touchscreen display for indoor and outdoor readability. MOTOACTV's touchscreen display is totally clear, indoors or out - and it switches for you so you can stay focused on training, not lighting. Sweatproof, rain resistant, shockproof, scratch resistant. MOTOACTV is built for your toughest workouts. That means it's sweatproof, rain resistant and scratch resistant - like you.